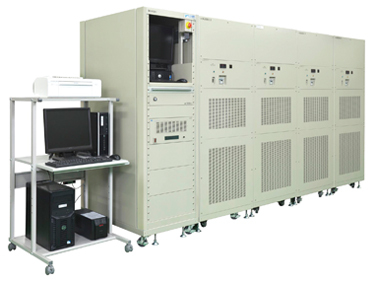 TOSCAT – Charge-Discharge Test Systems, Battery Materials testing and Quality Control |TOYO SYSTEM CO., LTD. The TOSCAT Series is the charge-discharge test system for batteries. These system are indispensable for conducting cycle tests or characteristic tests when developing rechargeable batteries, capacitors and other high-performance energy devices. Such systems are used in conducting research and development on rechargeable batteries that are used in mobile devices, hybrid cars and so on. We offer a lineup of products capable of responding to all needs from small-size to large-size batteries, and we are committed to designing, developing and supplying systems that meet customers’ needs. Precisely because we are a specialist maker of charge-discharge test systems, our TOSCAT Series can offer safety, low prices, high functionality and high accuracy. Powerful Support for New Materials Development! Our lineup caters to a wide range of applications from evaluation of materials to evaluation of batteries. These systems cater to almost all battery types including Ni, Cd, Ni/MH, LIB, EDLC and all-solid batteries. Since they are based on fine-current specifications, they are frequently used for developing materials and evaluating coin cells. (Up to 100Ch can be mounted per unit). ■ Space saving (approximately 50% compared to conventional types with 100mA specifications) (100Ch in housing that previously accommodated 48Ch). Standard for Charge-Discharge test systems! Our lineup caters to a wide range of applications from evaluation of materials to evaluation of batteries. These systems cater to almost all battery types including Ni, Cd, Ni/MH, LIB, EDLC and all-solid batteries. Systems are sometimes used for evaluating materials, and they can be used for evaluating batteries of 18650 size, etc. Ultimate for Multi CH and Space Saving! Keeping the features of the TOSCAT-3000 Series intact, this system helps reducing channel rates and is optimum for mass production equipment and quality inspections. High Performance capable of even Charger Simulation! An optimum system for actual load evaluation of GSM pulse etc. mobile devices. For Development of batteries for PHEV, HEV and EDLC! This is optimum for evaluating large-scale storage batteries used in electric vehicles, storage systems etc. It is especially ideal for running simulation of HEV, PHEV, EV, etc. ※Other adjustments can be made according to the customer’s requirements.